I will write a few lines to let you know that your letter of Dec 23 was duely received and was glad to hear from you all. Also the two dollars and the pictures was received, many thanks to you for so kindly remembering my children and sending them a Christmas present. We never thought of such a thing. Thanks to you for the picture; it is quite good. Well Christmas is past once more. Where did you spend it? I was at home all day. My baby is not very well. He had such a fever Sunday afternoon, Christmas Day Night and on Christmas Day I went down. I almost think it is teething. He has four teeth. Katherine is well and enjoyed her Christmas as children always do. She went to the Christmas tree and got a little book and a bag of candy. At home she got a book and slate. Her Aunt Rose from Lorain sent her a doll and Albert a book. Her Grandma Weinsz (gave) them over 2 dollars in money and many other little things they got. William is working at present. He is working for the C and M Railroad Co.; the car inspector went on a visit during the holidays and Will is working in his place till he comes back. They think the furnace will start to work next month then there will be some work again. The Mrs. Wendling out on the farm died a few weeks ago. The folks out home are all well. They butchered last week and we took one half of a hog on account of lard. I got over five gallon which will last me a long time. Now I will close writing, wishing you all a Happy New Year. Our regards to all. Write soon. Notes: I hope I haven't made this too confusing by posting these out of chronological order. The letter I posted on December 23 was written four years after this one. If I posted them in chronological order, I'd be posting one every 3 or 4 months for 6 years. For now, I'm sticking with my idea of posting them on the day of the year in which they were written, and I'll wrap it up with one Katherine wrote to her aunt in December 1899. Back to Tena's letter, I wondered if she meant Christmas Eve by "Christmas Day Night". She said it was Sunday and Christmas Eve was on a Sunday that year, so the answer appears to be yes. I also wonder when Christmas trees started to become popular home decorating items. I assume that when she says Katherine went to the tree and got presents, she means the Christmas tree at church. Tena and William were both children of German immigrants, so the custom of the Christmas tree would have been familiar, but it sounds as if they didn't have one at home. We don't know who "the Mrs. Wendling out on the farm was", but believe that the farm in question is that of her mother-in-law, Barbara Loehrer Weinsz. Barbara's husband, Nicholas Weinsz Sr., died 4 years before the date of this letter. And I'm not done wondering. 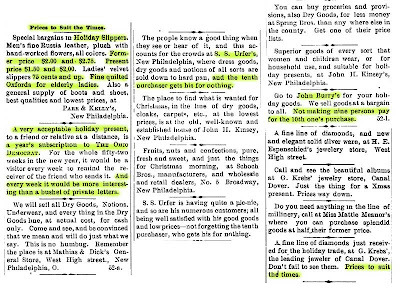 What would $2 buy in 1893? A local newspaper, The Ohio Democrat, had a small amount of advertising on December 21 and most of that was in the form of printed text just as if it was a news story. I got sidetracked reading the ads - much more fun than any modern ads I've seen lately. I've highlighted some of my favorites. Click through to read at full size. Your kind letter was duely received and was glad to hear from you all, was glad to hear you are all well which is always the best. I have not been feeling as well the month of December as I did in November. It is my stomach and bowles. Will and the children are well at this writing. Will is working at the coal bank. He has taken share in it. They have it nearly open and think they can soon dig coal ready to sell. There is an awful lot of work to open a new bank. The weather was rainy most all the month. Now it is quite cold and frozen. I will say thanks for the money, three dollars, that you sent. Of course I can not buy them anything now as I can not go out. The children are glad that Christmas is so near. They will have a Christmas tree in church. On Friday evening Katie has a piece to speak. Now I will close writing. Wishing you all a Merry Christmas and a happy New Year. Notes: The copy of the letter I'm transcribing here is dated December 24, but Albert also copied the receiving post office's postmark as December 24 and Tena mentions that Katie is speaking in church on Friday evening. 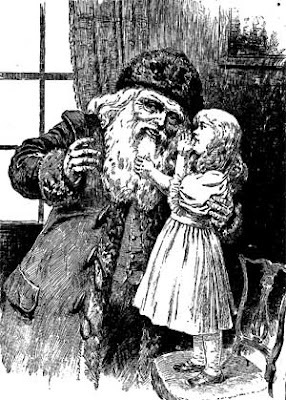 Christmas Eve was Friday in 1897. I assume this letter was written December 23 or earlier. Coal mining has a long history in Tuscarawas County, Ohio, and some of these were rather small enterprises. We were not aware of William Weinsz ever having had a share in any of them. 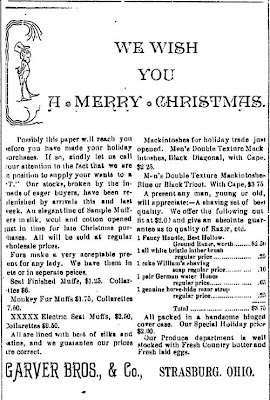 I'm not sure what three dollars would buy in the way of childrens' gifts in 1897, but the Garver Bros. store in Strasburg, Ohio was selling monkey fur muffs for $1.75 and men's shaving sets for $2.00. And if the cold and frozen weather then was anything like today, I'm sure many folks would have loved to take the railroads' offer to transport them to "Florida and other winter resorts". I take pleasure in answering your letter which you wrote October 9th and was glad to hear from you. How are you all getting along? I suppose you got entirely settled by this time. Well this looks like winter. The ground is covered with snow here and is still snowing some more. On Thanksgiving day there was a funeral on our street. Mrs. Pifer died age 55. What dull times we're having. The works are not started to work yet here in Dover. Will has no work yet. There are so many men without work. There is some stealing going on. There were 10 chickens stolen from one farmer. They cut all the heads off, leaving them lay and the chickens they took along. How is father and mother getting along? I suppose you see them often. Give them our regards when you see them. Katherine is well and happy all the time. She goes to Sabbath School every Sunday when it is fit to go. The baby is teething. He has three teeth. He is nine months old. He tries so hard to talk. He can say Mamma and Papa. How is the weather up there? It is cold and wintry. And what are you doing to keep yourself busy? News are so scarce so I will close writing hoping to hear from you soon. P.S. The houses here in town are numbered now. Our house is No. 21 North Fourth St.
Notes: Tena is my great-great-grandmother Christena Roth Weinsz. She is writing to her sister, Katie Roth Ruth, in North Amherst, Ohio. Katie married George Ruth in May of 1893, about 6 months before this letter was written. The "Will" who has no work is Tena's husband, William Weinsz. "Katherine" is their daughter (and my great-grandmother), Katherine Weinsz Gordon, and "the baby" is Katherine's brother, Albert Weinsz, the man who transcribed these letters from the original copies. I'm posting from his transcriptions. Her mother was Christena (Christina) Roth Weinsz, and she was writing home to her sisters in Lorain County, Ohio. Tena married William Weinsz and moved to his hometown of Dover, Ohio. How did she meet him when they lived 100 miles apart? That's one of our history's mysteries. I plan to post these on the day of the year in which they were written, but not in chronological order. I'll begin tomorrow with a letter from December 3, 1893. These letters are largely taken up with the day-to-day concerns of a young wife and mother of average means in late 19th century Ohio. They may not be riveting reading, especially if you don't know the players, so I'm going to include links to pictures and background material when I can. I began studying my family history in 1990. The 1920 US Census had just been made public that year, and it sparked interest among several family members to learn more. I began by trying to discover where my Dobbeck ancestors lived in Europe, and I had incredible beginner's luck when I found my great-great-grandfather's baptism record from Kokotzko, West Prussia in the IGI. When I first registered the domain name tangledbranches.com, I planned to use it to share my family history studies. Basic research in courthouses, churches and libraries (and now the internet) is good and necessary, but only goes so far. Contact with unknown and distant relatives has brought me so much more information than I could ever have discovered on my own. And most of these contacts have been made online - first on Prodigy (anybody remember that? ), then GEnie/Compuserve, and after a time, on the World Wide Web. I've been a very poor correspondent during some of that time though. Got too busy with my husband's business, garden blogging, home renovation, garden blogging, etc. Now, I want to begin to steer tangledbranches.com back toward my original intentions. But my databases are a mess from years of neglect and my software is out of date. It'll take some time to get that straightened out. In the meantime, I'd like to share some of the family history treasures that have come my way - the letters, photos, diaries and stories that are time-consuming to organize and upload via genealogical software, but much easier to manage through a blog. This is that blog and I welcome your comments and suggestions.